Other Products by Herbs Of Gold. Search other Heart Health products. 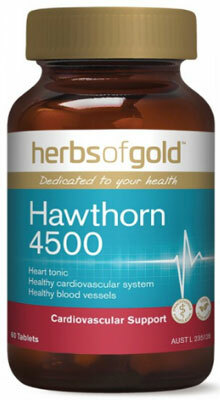 Herbs of Gold Hawthorn 4500 provides you with a herb that has been used for thousands of years, and is still a relevent medicinal aid today. Apart from its medical use, Hawthorn berries are commonly consumed whole, or turned into an antioxidant-rich jam. In Turkey, Hawthorn is prescribed as a relaxant, anti-spasmodic and diuretic1. Hawthorn Berries are perhaps one of the most well known natural compounds for the regulation of blood pressure, typically used for the management of hypertension (high blood pressure). However, the potent little berry found in Herbs of Gold Hawthorn 4500 can do a great deal more than this. Reasearch is indicating that hawthorn berries may also support the health of the nerves, liver, heart and kidneys, likely due to it high concentration of antioxidants2. Hawthorn, or Crataegus monogyna, has been identified to contain a number of potent antioxidants, including epicatechin, hyperoside and chlorogenic acid. Interestingly, epicatechin has also been identified in green tea, while chorogenic acid is believed to be the fat-burning or thermogenic compound found in green coffee. So, apart from supporting the health of the blood vessels, and regulating blood pressure, Herbs of Gold Hawthorn 4500 may be used as a general antioxidant to promote wellness3. 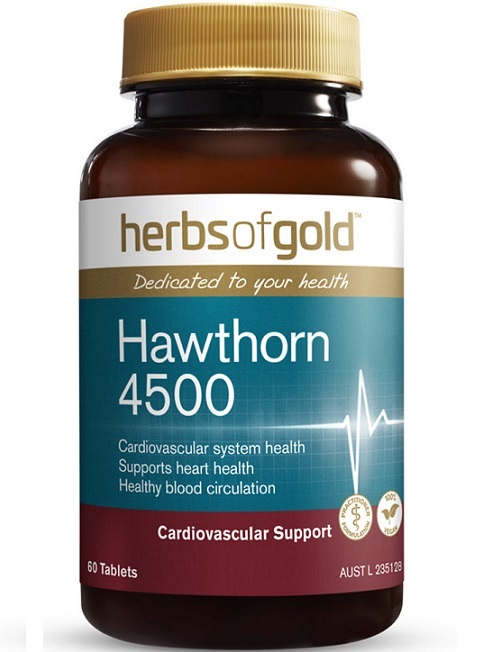 Herbs of Gold Hawthorn 4500 is is a fantastic while-body antioxidant, that may specifically assist with blood vessel and pressure health, mild anxiety and organ health.